Every morning on my walk to take my daughter to daycare, I pass Junior High School 51 on 5th Avenue in Park Slope. The sidewalks in front of the school are typically packed with kids waiting for their school day to start. The fact that schools are as much a piece of the fabric of the city as any business, home, or office is one of the things that I love about the neighborhood. I’ve also biked down 5th Avenue and hope to do so with my daughter in a seat on the back of my bike when the weather gets warmer. But the chaotic scene on the streets in front of William Alexander Junior High School would make me think twice. JH 51 has no drop-off zone for parents who need to drive their kids to school, so parents stop their cars in the bike lane instead. This practice forces people commuting by bike down 5th Avenue into traffic and in some ways makes cyclists less visible to car drivers and pedestrians, since they have to weave in and out of backed up traffic or wait behind or between stopped cars. With so many kids darting out from between double parked cars, it’s only a matter of time before a kid is hit by a bike or worse, a car. This driver didn’t just stop and drop his child off, he actually hung out for a bit and read the paper. Maybe he was waiting for his kid to bring him back something from inside the school. The SUV driver actually could have pulled into this empty space, but perhaps he didn’t want to get blocked in by a double-parked car. If the issue was simply that parents were pulling into the bike lane, dropping their kids off, and then leaving, perhaps I could get my head around just dealing with it. That’s city life, no? But these two cars idled in the bike lane for a while, too. In fact, with no traffic officer or school safety official directing cars, many feel free to linger as long as they want. The scene is sometimes worse in the afternoon when parents arrive early, double park, and then wait for their kids to come out at the end of the school day. 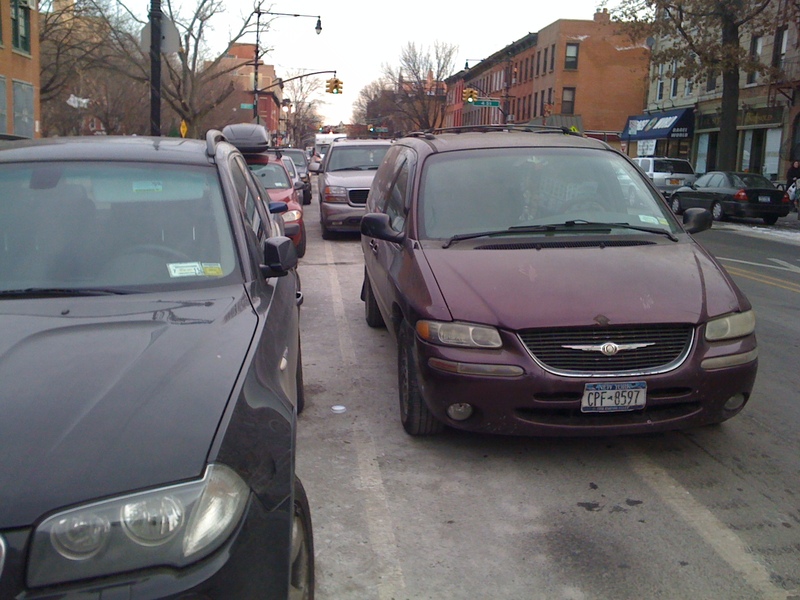 If you look between these two cars across the street, you’ll see a brown minivan with its blinkers on, parked in the other bike lane. From the opposite side of the street, you’ll see that the driver of the maroon car has just pulled out from where she had been idling, slowing down the B63 bus. The driver of the Ford minivan was sitting there long enough that I was able to go into a Bagel shop on the corner, wait in line, get some coffee, and come back out to find him still sitting there. 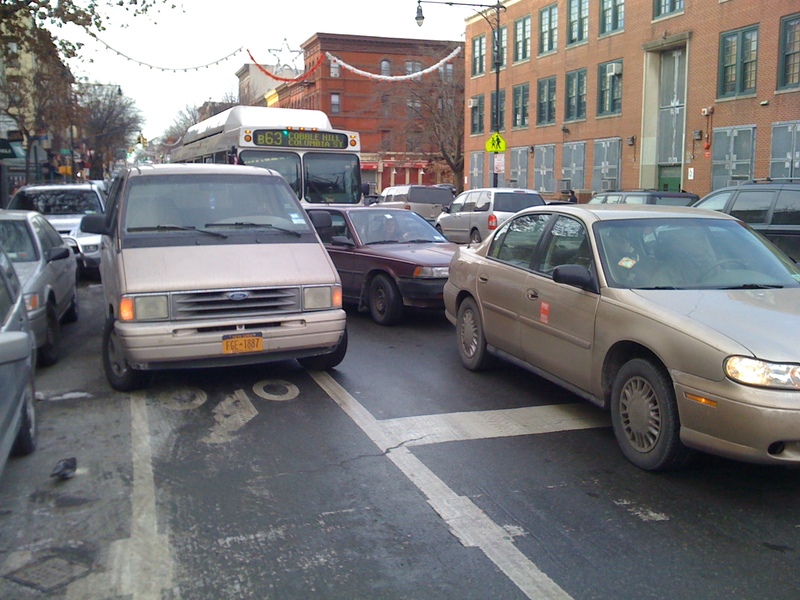 Bike lane or not, this practice of double-parking is bad for everybody. 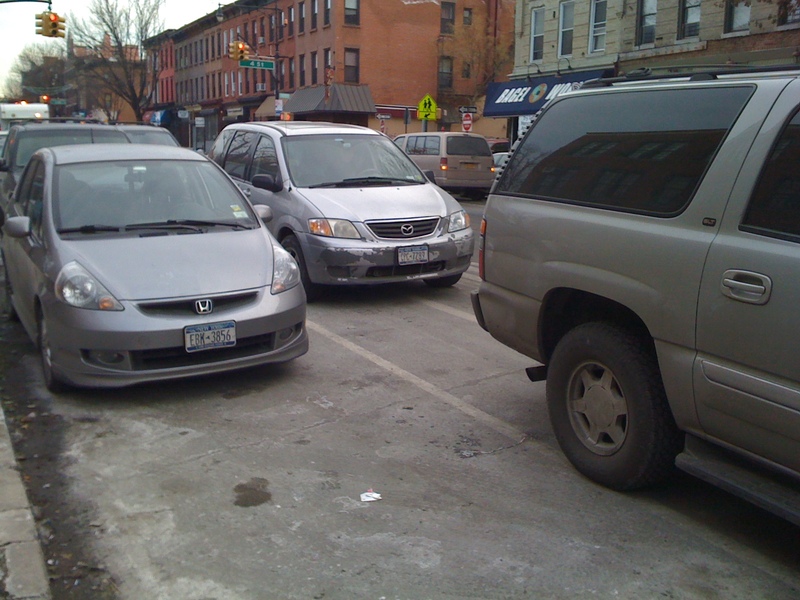 Cars heading up or down 5th Avenue have to squeeze through a narrow space that can make it hard for two cars to pass in opposite directions at the same time. Bus passengers, which includes lots of kids going to this very school, are inconvenienced, made to wait until the bus can get to the nearby stop. Pedestrians are rendered invisible by double-parked cars, and even the two crossing guards on either side of the school can’t guarantee complete safety. And of course, you know, the bikes. The bikes. Where is the NYPD enforcement on this? Will they spend their time giving out tickets in Central Park, or do something about a truly dangerous, or at least hugely inconvenient, situation? The solution is easy: eliminate the parking in front of the school, turn it into a loading zone, and have a traffic officer direct cars in and out of the curb space. The city wouldn’t even have to eliminate the parking all the time; it could simply enact no parking hours in the time immediately before and immediately after school. UPDATE 1/12/10: I checked this morning and there is a sign on the school side of 5th Avenue indicating that there is no parking on part of the block from 7 AM to 4 PM on school days, but this does not seem to be enforced at all. you’re right – simple signage and enforcement would solve this problem right away. 4 or 5 hours of No Parking would make that stretch of 5th Ave much safer and convenient for everyone. The SUV driver is after all always on the hunt for the next battlefield…. It needs wars to rage in in order to justify its presence on our streets. Imagine these ridiculous machines in our tiny, flat, urbanised, densely populated country….. But what usually does help here is simply to confront the people who are sometimes even unintentionally creating all these dangerous situations! You know how most brains have a hard time functioning once inside a horse-powered machine …. Is it not the school that should be held responsible for creating a safe environment for its pupils etc? But probably they will say it is your municipality who is responsible and then they will redirect you to your school etc. etc…..
Oh and counting on help from the police is something I’ve stopped doing a long time ago……. my guess is they’re just as incompetent your side of the ocean …. But maybe you should post your blog article including the visual evidence in the school itself?! and then add some nice happy go lucky shots of cargowheeling supermums and dads and cycle chic kids to showcase The Alternative…. Soldier on andkeep us posted! I blame it on a warped sense of entitlement. I am going to adopt your adjective “silly” to describe these situations in the future. In the past “frustrating” has been my word of choice, but that just makes me angry. These sorts of situations are absurd and I am just wasting my time trying to wrap my brain around them. Thanks for your post. Very educational! Please consider bringing these photos to the 78th Precinct Community Council meeting this month (Jan. 25th, 7:30 p.m. at the station house). Maybe we can pitch them on some enforcement. Will do! Trying to make sure I can be there for the meeting.